Yes we drank beer, my friends and I, boys and girls. Yes, we drank beer, I like beer, I still like beer, we drank beer. The drinking age, as I noted, was 18, so the seniors were legal, senior year in high school people were legal to drink. Yeah, we drank beer, and I said sometimes, sometimes probably had too many beers, and sometimes other people had too many beers. We drank beer, I like beer. But Maryland's minimum legal drinking age for beer and wine was changed to 21 from 18 in July 1982, during the summer before Kavanaugh's senior year. It was already 21 for hard liquor. Therefore, any drinking that Kavanaugh did in the state of Maryland during high school was illegal. Residents who had turned 18 by that time were grandfathered in and allowed to drink legally. Kavanaugh was 17 at the time. Maybe the other side doesn't deserve it, but I wish he'd told the truth. There's a lot I think about a judge and drinking. He liked beer. He likes beer. He drinks beer still. A lot of Americans can relate with him and say that they relate to the beer drinking, so male and so American, so representative of what it is to be an American now. Alcohol perverts judgment. That should be a serious concern for a judge. It doesn't help him. No one should feel nonchalant about it. The youth culture is also a party culture. It's assumed this is permissible. "Hey, he goes to church every Sunday!" He said church wasn't on his calendar on Sunday because it was like brushing his teeth, it was so automatic. Righteousness does not translate to a filthy mouth and the drinking of alcohol. Let us walk honestly, as in the day; not in rioting and drunkenness, not in chambering. One of the qualifications of a pastor is that his children are not accused of riotous living. -- not him, his children -- "having faithful children not accused of riot or unruly" (Titus 1:6). The word "riot" in Titus 1:6 is translated "excess" in Ephesians 5:18, which says, "be not drunk with wine, wherein is excess." I was reading an article recently that quoted the same verse in the ESV, that reads, "And do not get drunk with wine, for that is debauchery." That translation leads people astray on the meaning of the verse. It goes against the grammar. In the grammar, the real grammar, in the wine is excess, riot, or debauchery, not the act of getting drunk or drunkenness. The ESV misleads, and I think people are glad to have it. There are five Greek words in a row -- oino en ho estin asotia (noun, preposition, relative pronoun, verb, noun). Literally, they mean "wine in which is debauchery." The relative pronoun and the noun agree. The debauchery is in the wine. Kavanaugh isn't a choir boy. Kavanaugh is another Roman Catholic jurist, whose alcohol doesn't clash with his Christanity and his judgment. I don't trust Kavanaugh as a person. He might make conservative judgments, especially with his newfound intensity of hatred of leftist politics though. On June 13, 2018, my wife, two youngest daughters, and I arose and walked the 7 or 8 minutes to the Mestre, Italy train station to catch ours to Rome. We left around 9am for about a 1pm arrival. We got back to our house fairly early the night before and our train wasn't leaving that early. We could look out the window to see what Italy offered by train between Venice and Rome. The route moves through Tuscany, which is considered one of the most beautiful areas in Italy. Tuscany was nice, but for what I saw from the train, it looked a bit like parts of California that are equally beautiful. I live about 30 minutes from Napa Valley, which has a similar terrain, maybe even nicer in certain ways. Of course, we were on a train, which limits what you can see. We saw it -- nothing outstanding. The train went right through Florence. If we would could have stopped there and spent a day, I'd have more to write here. Rome doesn't have a great public transportation system, compared to London, Venice, and later Paris. We didn't have many options to get to our room. We got off at Roma Termini and had to figure out the public transportation system. We live in a metropolitan area, so catching busses and trains is normal to us, but Europe is different and every big city in Europe is different, especially in different countries. We took a bus that let us out still pretty far to walk with our luggage on narrow, rugged walkways and heavy traffic. I know you can tell this by looking at a map, but Rome is an entirely different area in Italy. The area is much different than Northern Italy, as are the people. The people from both places will tell you that. It's similar in that way to the United States in the sense that you've got regions with a lot of variation, even in the same state. California is vastly different both in people and topography in various regions. What sticks out in Rome right away is that you are in a major metropolitan area, but you are also in an amazing historical and archaeological location. It's both. There isn't anything like that in the United States. I have never been to anywhere in the world like that. I would think Athens is and perhaps a few more locations such as that. We stayed in an apartment on the eighth floor about a thirty minute walk from the Coliseum. We had to wait for our hostess to arrive. Rome was warm, so we found a little shade and waited. While we did, one of my daughters and I fond the nearest grocery store to get a few things we knew we'd need while we were in Rome. There they also did not know English. You can do enough to do business and it gives you sympathy for people in the United States who don't know your language. Italy is not a third world country. You can get what you want or need there. Only three people could go up in the little old school elevator, so I waited with a daughter downstairs for it to go up and down. The hostess, who was a native of Rome, gave us some tips, showed us everything, and left. We got settled in and freshened up. Something I haven't mentioned was that in two different places we took the key with us and had to send it back. The first was the very first place we stayed and we sent it right away in London. It worked out fine. I will say that we also sent some postcards from London back to the United States, one of which arrived three months later. Disappointing. Mailing the key was an adventure. I found a post office about three blocks away and went in and asked if I could get an envelope and send the keys. He didn't know English. He was able barely to explain that I needed to get my own envelope. I tried about three different places, and one of them said the tobacco shop. The tobacco shop. If you grow up like I did, you don't go into a tobacco shop. However, in Italy the tobacco shop is the Italian version of a convenience store and it is the place you get your public transportation tickets. That was good to find out almost right away. They're all over the place. They had the envelope I would need, so I went back to the post office, addressed the envelope to the Venice host's parents, and finally it all worked. He got the key over a week later. Our goal for the late afternoon and evening was to go to the heart of Rome and go on a walk starting at Campo de Fiori. First, we would eat in the late afternoon. I can't remember the name of the restaurant, although I could look it up. It was one little room with very cramped small wooden tables. We liked it. It was a good start to the food of Rome for us. 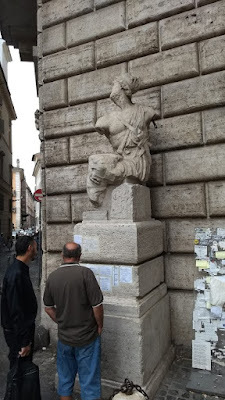 It was near the famous statue Pasquino, which is along the walk, and we would get started once we were finished eating. I'll return next week, Lord-willing, to describe that night and the next . At some other time in some other post, I'll talk about mid-week services this week and the next. We went the first and second midweek in London and Ripon. It wasn't too hard to find a place to attend in England, even if we had to go a little bit out of our way. We were glad to do it. It's a major part of our trip. We decided in advance before our trip, not because of time, but because we decided we could not do better than meeting on our own, something I would have never done until a few years ago. I'm convinced in rare instances, it's the best thing to do. Recently a friend of mine asked me to evaluate the following paper: Smith, H.B., Jr. 2018. The case for the Septuagint’s chronology in Genesis 5 and 11. In Proceedings of the Eighth International Conference on Creationism, ed. J.H. Whitmore, pp. 117–132. Pittsburgh, Pennsylvania: Creation Science Fellowship. The author is Associates for Biblical Research's lead researcher for the Genesis 5 and 11 Research Project. Associates for Biblical Research has some quality material on the Bible and archaeology, but, regrettably, Mr. Smith's attack on the chronology of the Hebrew Masoretic text and defense of the LXX cannot be included among this high quality material. The conclusive reason why Mr. Smith is wrong in his defense of the LXX's chronology in Genesis 5 and 11 is that his position contradicts God's Word. Mr. Smith argues: "Scripture’s promises that God will preserve His Word do not specify how those promises will be carried out. . . . Rather, it merely promises preservation (Mat. 5:18; 24:35; Luke 16:17; I Pet. 1:24–25; Is. 40:8), which has subsequently occurred in complex ways over many millennia." Mr. Smith would have done well to read and accept the Biblical truth in Thou Shalt Keep Them: A Biblical Theology of the Perfect Preservation of Scripture, or, indeed, simply examined Matthew 5:18 a bit more carefully. The Lord Jesus promised: "For verily I say unto you, Till heaven and earth pass, one jot [the Hebrew letter yod, the smallest Hebrew consonant] or tittle [the chireq, the smallest Hebrew vowel] shall in no wise pass from the law, till all be fulfilled." The Lord Jesus promised that the inspired Hebrew text dictated by the Holy Spirit through the human instrumentality of Moses, Isaiah, and the other Old Testament writers would be perfectly preserved, rather than the Hebrew words being lost while a Greek translation would preserve (?) God's message. (Please see the studies on Bibliology here for a great deal more Biblical teaching on preservation.) Matthew 5:18 makes Mr. Smith's position impossible. Of course, Mr. Smith cites no sources that actually argue that every Biblical scribe was infallibly moved by the Holy Spirit or that there would be infallible copying of individual manuscripts. The actual Biblical position, which he ignores in his paper, is that God would preserve every one of the Hebrew words of the Old Testament (Matthew 5:18), that those words would be continually in the mouths of God's people (Isaiah 59:21), and that God's people and institution, Israel in the Old Testament and the church in the New, would receive those words (Isaiah 40:6-8; John 17:8; Matthew 28:18-20). These Biblical presuppositions necessitate that the Christian today receive the Hebrew Masoretic text and the Greek Textus Receptus as the preserved Word of God. Mr. Smith attempts to argue that one who declares that attempts to explain the LXX numbers are wrong when they are larger than those in the Hebrew Masoretic text fail. Their failure is allegedly because one must have "a specific and adequate motive for inflating the numbers," something for which "there are no ancient testimonies," and, furthermore, "it would have been impossible for the LXX translators (or anyone else) to get away with such a fraud due to the subsequent dissemination of the LXX" (121). Of course, there are no ancient testimonies about what the LXX translators did in Genesis 5 and 11 because we have no idea who they were, we are not certain when they lived, where they worked, or practically anything else about them. Indeed, there are good grounds for doubting that there ever was a "the" LXX, rather than a multiplicity of Greek translations of the Hebrew Scriptures; the Letter of Aristeas, just about our only original ancient source on the origin of the LXX, makes reference to earlier translations. Asking defenders of the Masoretic Text to supply the specific motives of the LXX translators in Genesis 5 and 11 when we do not even know their names, their location, the time they did their translation, or just about anything else of the sort is an utterly unsupportable requirement, somewhat comparable to requiring one to specify the eye and hair color, as well as the type of drink he likes with his breakfast, for a person when one does not know his name, have any evidence of his looks, or even know the continent and century in which he lived. Furthermore, Mr. Smith's argument that the LXX in Genesis 5 and 11 became widely disseminated, and so could not be corrupt, proves too much, even for him. His article shows awareness of the astonishing corruption evident in other equally widespread portions of the LXX (e. g., Jeremiah 26 in the Hebrew text and the Authorized Version is Jeremiah 33 in the LXX; Jeremiah 48 in the preserved Hebrew text is Jeremiah 31 in the LXX, etc.) But how could such corruptions be possible? Was not the LXX of Jeremiah widely distributed, just like the LXX of Genesis? Were Mr. Smith's argument valid, it would prove that there was no serious corruption anywhere in the LXX--a supposition he himself knows to be false. Mr. Smith makes the astonishing affirmation that we are to explain the differences between the LXX numbers in Genesis 5 and 11 because of "deliberate chronological deflation in the proto–Masoretic Hebrew text by the Jewish rabbis in the post–AD 70 period" (122). They allegedly were able "to introduce wholesale chronological changes into the biblical text while also purging the higher numbers from the textual stream. . . . In the aftermath of 70 AD, it became possible for the rabbis to amend their Hebrew MSS and hide the trail of evidence," making "radical chronological alteration permanent in future manuscripts" (122). Why, one wonders, would they allegedly corrupt the entire Hebrew textual tradition in Genesis 5 and 11? It was because the numbers in Genesis 5 and 11, Smith argues, were changed in the Hebrew text because they disprove the Messiahship of the Lord Jesus (122)! Mr. Smith's allegation here is ridiculous. First, the motive given for changing Genesis 5 and 11 is laughable. Why did the Rabbis change Genesis 5 and 11 to disprove the Messiahship of the Lord Jesus, but leave untouched Isaiah 53 and the countless other passages that prove the risen Savior is the Messiah? Second, his affirmation that the Rabbis corrupted the entire Hebrew textual tradition and then hid all the evidence is simply factually impossible. Why does every pre-Masoretic manuscript found outside of Qumran (Masada, etc.) agree with the Masoretic Text? Why is the Masoretic text so strongly supported at Qumran as well? Did the post-70 A. D. Rabbis not only cover their tracks so well that they left not a scintilla of evidence for their corruption of the Hebrew text, but also go back in time to corrupt texts made decades or even centuries before they were born? Were piddly disagreements among Jewish Rabbis recorded and discussed ad nauseum in the Jewish ancient literature such as the Talmud, but radical corruptions of the Hebrew text universally agreed upon without any evidence that it ever happened in the ancient Jewish sources? Furthermore, any student of the Hebrew Bible is well aware of the strong evidence that the scribes of the OT were unwilling to change the text in this sort of way. Has Mr. Smith read the Old Testament through in Hebrew? Has he read the Greek LXX? Mr. Smith would require that post-70 A. D. Rabbis got together, changed wholesale the Hebrew of Genesis 5 and 11 to attack the Messiahship of the Lord Jesus while leaving hundreds of plain Messianic prophecies untouched, covered up all the evidence that this ever took place, and even somehow planted evidence that predated them. Sadly, such notions sound more like wild-eyed conspiracy peddling than the sound scholarship that characterizes a great deal of the work of Associates for Biblical Research. There are other egregious problems with Mr. Smith's article. He does not in any way adequately deal with the textual variation within the LXX itself on Genesis 5 and 11, as evidenced in the textual apparatus in the Gottingen LXX; his article is filled with special pleading; it contains numerous strawman arguments; etc. One wonders if Mr. Smith's fundamental reason for arguing against the Hebrew text the Lord Jesus promised to preserve in its every consonant and vowel (Matthew 5:18; Luke 16:17) is an apologetic one, evident in his concern about Carbon-14 dates allegedly at variance with the chronology in the Hebrew text of Genesis (128). Such an apologetic desire is commendable, but rejecting God's promises to preserve His inspired Hebrew words while making poor arguments in favor of the too-often corrupt LXX is not the way to go about defending Scripture. The consistent Christian who believes God's promises to preserve every Greek and Hebrew word that He inspired does not need, for example, to believe that there are no gaps in the genealogies of Genesis 5 and 11 any more than he needs to believe that there are none in the genealogy of Matthew 1. Indeed, Luke 3:36's reference to Cainan is conclusive proof to the Christian perfect preservationist that the Genesis chronologies can have gaps. The genealogies cannot be extended indefinitely--to use an extreme example, if there were, say, several thousand years between each name in Genesis, the genealogies would be a poor joke--but the affirmation that there were no gaps is simply contrary to the evidence found in the Biblical text itself. Furthermore, even were one to (improperly) concede that there were no gaps, and somehow explain Luke 3:36 away, Christ's promises to preserve the Hebrew text are of infinitely more significance than particular attempts to explain Carbon 14 readings, and apologetic concerns cannot justify jettisoning the doctrine of preservation and God's preserved Hebrew words to embrace a Greek Old Testament text containing many evident corruptions, even apart from the far more serious apologetic difficulties that would arise from accepting the factually impossible notion that a cabal of Hebrew rabbis successfully corrupted the entire Hebrew textual tradition, requiring Christians to attempt to pick up the pieces from a Greek text with many corruptions evident to all. In upper central Greece along the slope of Mount Parnassus resided the ancient city of Delphi. The ancient Greeks considered Delphi to be the center of the world, the world personified by the mother earth goddess, Gaia, and Delphi her navel. Delphi comes from a Greek root, which means "womb." The story was that Zeus had found the origination of the earth at Delphi by sending out two eagles to search. Later, Apollo, the brother of twin sister Artemis (Diana) and the son of Zeus, the Greek god, slew Python or Drako, a serpent that protected the navel of Gaia. The legend was that the Pythia was the original priestess in the worship of Gaia. When Apollo slew Python, its body fell into a fissure at Delphi, releasing fumes that intoxicated Pythia, sending her into a trance and allowing Apollo to possess her spirit. Then she prophesied, becoming his oracle. The Greek author Plutarch, who himself became an actual priest at Delphi in the first century A.D., wrote about the oracle of Delphi and described how a woman would enter a small chamber in Apollo's temple and inhale sweet-smelling vapors ("pneuma") from a fissure in the mountain before entering a state in which she would provide responses to seekers' inquiries posed to her mediated by priests, who interpreted her pronouncements. Delphi is 123 miles away from Corinth. It doesn't look very far on a map. Today it's about a three hour drive around the Gulf of Corinth. In ancient times, people travelled great distances to ask the Pythia questions. In 1 Corinthians 12-14 Paul confronts a case of paganism mixing with true doctrine, dealing with ecstatic utterances interpreted as divine revelation, often the more extreme the more likely its credibility (1 Cor 12:1-3), unknown languages (1 Cor 14:1-27), and female prophetesses and their asking the questions rather than being asked them (1 Cor 14:34-35). Earlier in 1 Corinthians (1:18, 21), Paul said "it pleased God by the foolishness of preaching to save them that believe." "Preaching" (kerugmatos) isn't a style of speech, oozing with feeling and stylistic dynamics, but the content of the proclamation, and this is how the word was used in ancient literature. In 2:1-5 he goes further to emphasize the effect wasn't in the excellence of the speaking that he did, excellence being the superiority of the person, but in the message, the testimony of God. He spoke the words "which the Holy Ghost" had taught him, or with him as an apostle, in other words, he spoke scripture. Of all the mentions of "the power of God" in scripture (13 of them and all in the New Testament), five are in 1 and 2 Corinthians. The power of God rests in the Word of God, not in some means of a human intermediary channeling power akin to a Delphic oracle. In another mention, Paul says the gospel is the power of God (Rom 1:16), again emphasizing the message, not the oracle. When the said power stands in the message, the substance of the preaching, God gets the glory or that "no flesh should glory in God's presence" (1 Cor 1:29). God's presence is in the preached Word of God. Later Peter says that God is glorified when a man speaks "as the oracles of God" (1 Pet 4:10-11), which is scripture. You know it is the Spirit of God when it is the Word of God, this being how someone knows God's presence. The oracular or ecstatic speech that accentuates the experiential, the euphoria of style, glorifies man. It is not what God has chosen to confound the wisdom of this world. Anyone who hears a "powerful" speech by a dynamic orator could glorify the speaking of that man, but that isn't how God chooses to persuade men. It makes sense to men, but it isn't what God uses. When I write this, I'm not saying that a speaker attempts to be as dry and monotone in speech as possible. I'm saying the emphasis is not on human means to sway. Powerful preaching isn't related to technique, strategy, gesticulation, raving, or passion. It's not a Billy Sunday pose or the visage and voice of a Billy Graham. Through history, oracular religion, hearing voices, and then ecstatic speech are all manifestations of paganism. Mormon doctrine says that Joseph Smith was an oracle, given the translation of the Book of Mormon. Part of the doctrine of Roman Catholicism is visions and apparitions. For instance, Teresa of Avila, a Catholic "saint," in the sixteenth century was a Spanish Catholic mystic and in her own book about herself, she wrote (Life, p. 27): "being at prayer, I saw, or rather (for I saw nothing, either with the eyes of the body or with those of the soul) I felt my Savior near me and I saw that it was he who spoke to me." She also wrote: "I have rarely beheld the Devil in any form, but he has often appeared to me without one, as is the case in intellectual visions, when as I have said, the soul clearly perceives someone present, although it does not perceive it in any form." I've heard others tell me in many instances one or the other of these experiences Teresa testified to having. These subjective experiences are supposed to mark supernatural intervention. At the beginning of Acts, Luke wrote to Theophilus that Christianity came with infallible proofs. These were supernatural proofs that God was involved with what was occurring in the story of Luke and Acts in fulfillment of prophecies. Everything and everyone that is going to say it is God or of God must give some kind of supernatural basis that would at least seem to evidence God. In your own Christian life, you want to know that it is real, that it is of God or God working, a true relationship with God. Many, maybe even a majority, of those who claim to be something Christian look to their own personal experiences to confirm that what they have is of God. Taking LSD was a profound experience, one of the most important things in my life. LSD shows you that there’s another side to the coin, and you can’t remember it when it wears off, but you know it. It reinforced my sense of what was important—creating great things instead of making money, putting things back into the stream of history and of human consciousness as much as I could. Psychedelic drugs, Jobs said, made him think different, altered his consciousness enough to get a different look at the world. I've heard several advocate the same since I've lived in California. It reminds me of the fumes inhaled by the Pythia before she offered her insight to a visiting inquisitor. This information that apparently comes from outside the body seems elevated to what someone learns with a natural method. Sir Arthur Conan Doyle, author of the Sherlock Holmes series of books, also subjected himself to Victorian spiritualism. He believed in it. He believed God sent solace to those bereaved after the death of a family member, using mystical means. Clairvoyance is the ability to see what isn't physically present, clairaudience is the ability to hear spirit's voice or thoughts, and clairsentience is the ability to sense what a spirit wants to communicate or to feel sensations from a spirit. The Bible and historic Christianity has rejected these experiences as not of God. They are either someone deceived, someone lying, or a demon. I've heard lots of different personal, subjective happenings to validate someone is operating under the jurisdiction or within the working of God, not unlike the visions and apparitions of Roman Catholicism. It's heavy in the Charismatic movement, but it's now maybe just as prevalent among evangelicals of different stripes, who would say they are non-Charismatic. Some are revivalists, and even those who deny revivalism still have some kind of mysticism in their professing Christianity. They say they sense God or feel the Spirit of God. These sensations in almost every case are not verifiable. We have a completed and sufficient Word of God. It is not to be added to or taken away from. This is how God speaks today. There are experiences that believers have outside of the Bible, but the Bible is the final and infallible authority for the validity of those experiences. They are judged by the Bible, proven by scripture, or tested by the Word of God. For instance, fruit of the Spirit shows up in the life of a believer yielded to the Spirit of God, which is to be obedient to scripture. Love shows up. That's an experience. Patience shows up. That's an experience. These are all defined by scripture. They can be judged by believers according to the Word of God. This is how God wants us to live. On the other hand, men move outside of the Word of God into their own experiences as validation. This is not living by faith, but by sight. It doesn't please God. It doesn't bring glory to God. Many bad practices, against or outside of scripture, are justified by extra-scriptural mystical experiences. False doctrine is taught and confirmed by sensations attributed to God by someone without any biblical means of verification. Perhaps worse, the voices or calls or feelings explained above devalue scripture, and very often are elevated above scripture. They are viewed as a superior form of relationship with God, more personal than the Bible. Many of those who claim these experiences see themselves as having a higher form of spirituality, or even something of the power of God, not possessed by those who depend only on scripture. Those with just scripture are thought or said to be missing something, a kind of spiritual have-not. All of this is ripe for compounding deceit. When I was young in a small Indiana farming community, off and on we owned various black and white televisions and sometimes watched Wide World of Sports on Saturday with host Jim McKay. Then I first saw the Harlem Globetrotters play, Meadowlark Lemon and Curly Neal. They always played the New Jersey Generals, and won every time. It wasn't real. Everyone knew it. They defied the rules of basketball, the audience played along, and everyone knew, they knew, that what they were doing and we were watching was concocted. Very little was at stake. It was all just fun. We shouldn't take the Globetrotter approach and use it on Christianity. Maybe for some basketball is sacrosanct, not to be touched with such profanity as the Globetrotters. It doesn't matter to me. However, Christianity is and should be sacred. It can't be modulated or modified or adapted for whatever purpose. And yet it has been and it is. And different explanations are given for why it is appropriate, even though it isn't. The contention of this piece is that very little genuine Christianity exists anymore. It's been given the Globetrotter treatment. With the Globetrotters, the referees didn't do their job on purpose, so they were also in on the concoction, turning basketball into something different in nature. All the props were there to give the impression of basketball. The Globetrotters were concocted. Christianity has its referees on earth, the ones supposed to be responsible for keeping it real and true and pure, not making a joke of it and not allowing it to go astray. The rule book is the Bible, it's plain, and it's simple. Christianity's referees have been on the concoction too. Most of Christianity is some concoction now. There is a lot at stake with Christianity being a concoction. It relates to this life, but also the next. God isn't pleased. That's very bad -- very, very bad -- but it doesn't stop there. If it isn't real and true and pure, people will go to Hell, separated from God forever. It should matter to the referees. The pastors, the major leaders in Christianity, should be about keeping Christianity according to the Bible. Concocted Christianity isn't Christianity. It is concocted to look like it is, using some of the same terms and relying on the same rule book. The concoction gives the impression or an attempt is made to give the impression that it is Christianity. For most, it's good enough. It doesn't have to be the same, just good enough. It fools people, but it will never fool God. He authored Christianity, knows every difference, and isn't fooled for one moment. How is a new Christianity concocted? Christianity departs from scripture. You could say, churches depart from scripture. Scripture clashes with the world. If a person, a family, or a church believes and practices the Bible, they're going to clash with the world. Rather than clash with the world, if an individual, family or church change Christianity closer to the world, to what the world is and does, which will mean departing from scripture, it will clash less with the world or not at all. The way Christianity functions, according to scripture, which is the only Christianity, not a concoction, is not complicated. It's clear and simple. The problem is that it clashes with the world. The referees need to keep it in line, but they haven't. If they say, let's conform to scripture and clash, it appears they will shrink in numbers and they do. They concoct a new Christianity that doesn't clash and waylays shrinking. It is akin to the people walking away from Jesus in John 6 and Jesus saying, "Stop, I'll concoct something different, more in line with what you want, please stay." The world mobilizes an array of forces against Christianity. Whatever Satan has in the world system, he uses. Bringing down Christianity is all he has left. He won't fully accomplish it, but he and the world system do a lot to get as far as possible in this endeavor. It has worked very, very well. Based on most measurements, Satan has succeeded and is growing more and further in that success. Christianity is about God, but man wants to serve himself. This is the sphere or realm where the departure from scripture occurs. Individuals, families, and the church consider what man wants, what they want, more than what God wants. Romans 1 calls it worshiping and serving the creature rather than the Creator. A new Christianity is concocted. What characterizes it is lust. It's not sacred any longer, profaned by what pleases men, which again is lust. The lust itself, the feelings that arise out of lust, are very often confused as something spiritual, and, therefore, of God. The church becomes more and more like the world and less like God, fully deceived that it is about God. God Himself isn't good enough for people, so the Christianity concocted conforms God to what people do want for themselves. The God they want is more like a genie in a bottle, who is there for them to give them their wishes. The message fits what they want out of life. Worship itself is determined by what gives them the feeling they want. The concocted Christianity grows, which is said to testify of divine provision, the approval of God. The feelings are said to be caused by God. Receiving what they want is called blessing. God is Who He is. Concocted Christianity has a different god, one who approves of what its participants need him to approve. He takes what they give him, even if he doesn't really. God isn't whoever we imagine him to be. When concocted Christianity forms its own god, he isn't God. The Globetrotters isn't basketball. The god of concocted Christianity isn't god. The concocted Christianity has causes used to vindicate it. Certainty is pride, so it fights pride and justifies doubt. It battles division with toleration. It cares more except with sentimentalism, not the deferred gratification of eternal reward. Scripture is used conveniently and flexibly to rule out what they dislike and advocate what they love. One other major way concocted Christianity attempts to exonerate itself is by saying that it doesn't ruin major doctrines. At worst, it is claimed that it changes smaller or small ones and the application of cultural issues, keeping most of the framework intact for the most part, which they might also argue is all that should be expected. However, doctrines really do change, including their so-called major doctrines. Another Christianity is not concocted without doctrines being affected. People have a different take, a distorted perspective, on what scripture is, on who God is, on what salvation is, on what true worship is, what church is, what Christian living is, and more. Everything changes and everything has changed. When the adherents of concocted Christianity compare it to the real thing, they can't recognize it. The referees, those governing concocted Christianity, tell them Christianity isn't what's real. It's extreme, even hyper -- "just keep walking, you'll be fine." It looks false to them. It looks too certain, too intolerant, and too strict. They want the safe feeling they get from concocted Christianity, even if it isn't Christianity. It's a false sense of security, like the fish swimming in the dragnet, unaware of danger. One other factor for not knowing that professing Christians are in a concocted Christianity is that they have stopped comparing their concocted Christianity to scripture. They think they're comparing it to something authoritative and it rings true, but very often it's just a feeling that they have and then the conjectures of leaders, who have stake in their participants not knowing. Very often it's just the blind leading the blind. A lot of people are on this road, so they also say, there are so many people who agree with me, so they rely on a new norm that's not acceptable to God, but they assume it is, because of the numbers they think they see on their side. When we watch the Globetrotters, we know it's concocted. That's how easy it is to judge concocted Christianity. Concocted Christianity is a placebo against the worst possible ills. Even worse it inoculates against the real thing. Venice has a permanent population of 55,000 and 20 million visitors a year. At most moments, far more tourists dwell there than permanent inhabitants. It's not really built for the number of people who are normally there. I'm glad to say we missed the high point. There were crowds, but it didn't seem that cramped on June 11 and 12, Monday and Tuesday, 2018. For as many people as there were there and in some locations, especially San Marcos square, you can still find an entirely empty walkway or even piazza, even feel all alone. I understand those who say that every corner you turn in Venice is another surprise. Nothing is normal there. It was impossible to get up to speed on every place we went on this trip ahead of time. It was enough, really, to plan it and pull it off. I did reading, one travel book and a few essays. Something you can do, so as perhaps not to stress about this before your trip, is to understand that you can read about the place you visited afterwards. Get up to speed later. You can savor your trip then. 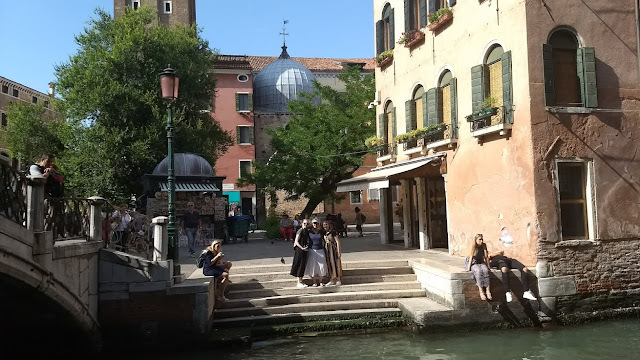 Everywhere you look in Venice, at least for me, you want to know more. There are too many things to look at to know everything that you're seeing. 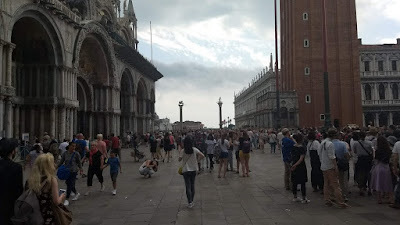 For a day and a half, essentially we just enjoyed Venice. Our host was Venetian. He knew a lot from a Venetian perspective, but even so we couldn't learn it all. Venice is full of art. It was our first major art experience on the trip. When it comes to art, I still don't know most of what I'm seeing, and what it means. It's usually religious though, Roman Catholic, from the same era, old, done by very skilled painters and sculptors. On Tuesday, June 12, we rose late after the early a.m. arrival the night before. 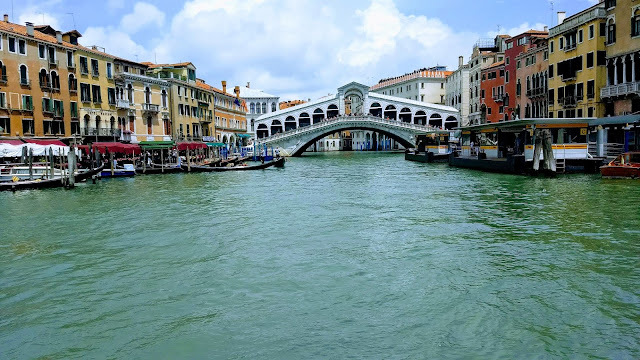 We replayed the previous day's travel: train, vaporetto down the grand canal, except exited a few piers early to walk a short cut to St. Mark's Basilica in San Marcos square. We had prepaid tickets. We missed a long, long line with a very busy square. In the U.K. we toured several cathedrals. We added two more in Italy. St Mark's was laid out like everything else. It seemed like something to visit. It's number one on most lists, but I didn't have a good impression. It was dark, hot, and crowded. There was really little to see. We didn't stay long. It was sort of, been there, done that. 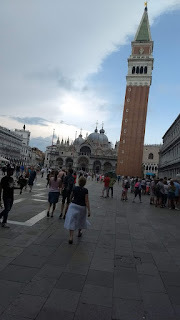 We decided not to attempt to go up the tower, and just make our way back to the train, slowly walking Venice. Part of what you do in Italy again and again, which we did, is gelato. We had already done it the night before and did it at least twice more. I say the best you can do in Venice is slow walk through it. Eat little food items. Buy something. Sit, watching a great scene, while eating gelato. Nothing is like the Italian coffee experience. The U.K. had its tea. Starbucks founder learned coffee from Italy, but Italian coffee is still its own thing. Part of it is the service, which brings an experience. 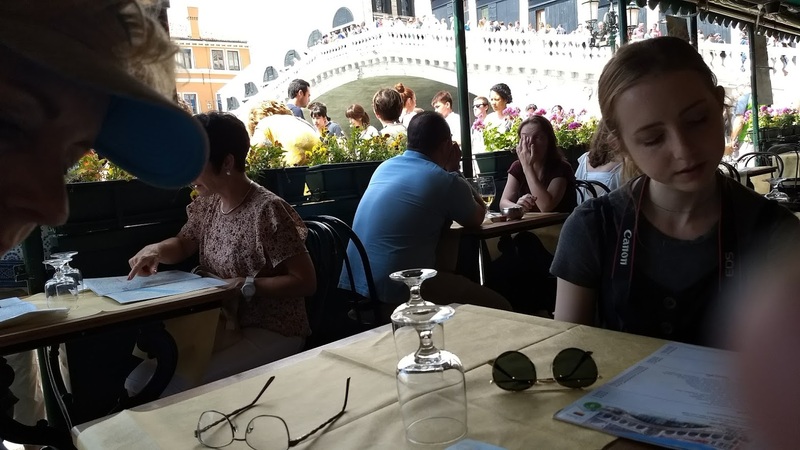 We sat at a restaurant right next to the Grand Canal and the Rialto Bridge. We went with sharing four different desserts and then coffee. 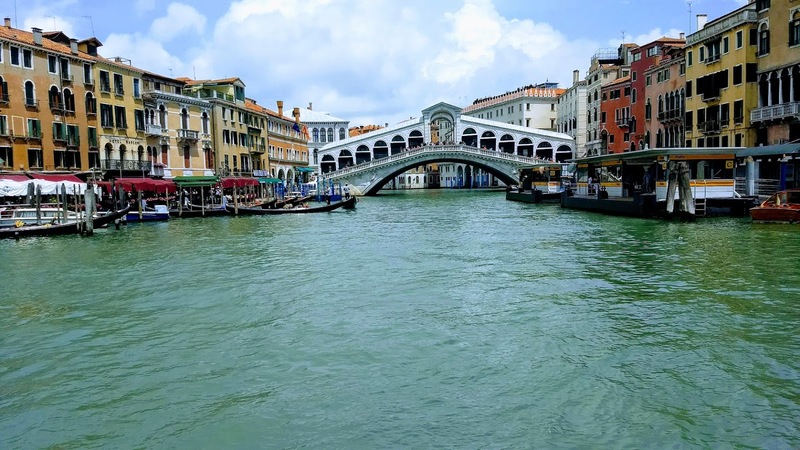 This is the way to make your way through Venice. We stopped at an Italian leather shop and bought my mom some Italian leather gloves. The Italians have a unique take on leather, hence Italian leather. Every breath in one of these shops is that rich leather scent, nothing like it. 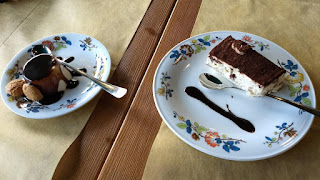 We decided to leave Venice in time to go into Mestre to an Italian restaurant owned by a friend of our host. 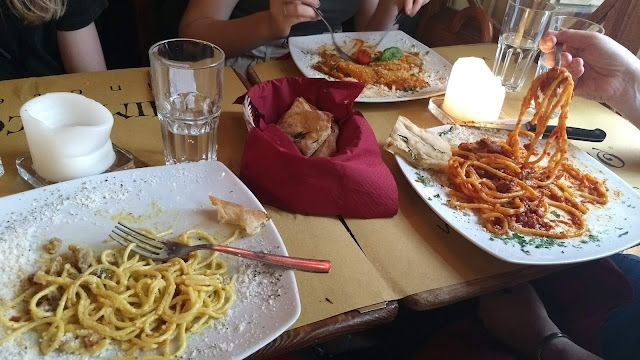 We ate outdoors traditional Italian pasta and it was terrific. We got home at a good hour for a regular night sleep. We would be leaving between 8 and 9 a.m. the next morning by train to Rome. Roberts’s “claims to special insights and divine orders and supernatural visitations” led critics to say that his “overheated imagination . . . [was] a fatal blow to real . . . religious movements.” Indeed, after Roberts’s ministry had run its course, in the areas where he had preached “the revival disappeared, and [Roberts’s work] has made those valleys in Wales almost inaccessible to any further divine intervention.” “Many . . . voiced criticism of the revival for its failure to achieve any long-lasting results,” and Roberts himself, some time later, “explained [as] tragic errors” a variety of his supernatural declarations, affirming that they were “evidence of Satan’s power to exercise control . . . by entering into the heart, influencing the mind, and troubling the spirit.” Thus, Evan Roberts himself affirmed that Satan had entered his heart and affected his mind and spirit during the Welsh holiness revival. “Roberts later became very critical of the revival for its emphasis on emotional excess and what he saw as the influence of demonic powers.” He declared: “[D]uring the revival in Wales, I, in my ignorance, did not escape the wiles of the enemy.” Indeed, Evan Roberts confessed that he had not “escaped the wiles . . . [of] the arch-fiend,” but had “deep, varied, and awful experiences of the invisible powers of darkness.” In “later years . . . he . . . would question whether it was the Holy Spirit who commanded these things,” and “he confessed to a fear that he had been tricked by Satan.” In fact, he came to see that many of the “visions and voices he had known and all the examples of his strange power to look into people’s thoughts and feelings” were “proof that he . . . had been deceived” during the Welsh holiness revival. He likewise recognized that in important aspects of his Keswick holiness message “he had been deceived by the father of lies.” His admission that much of his teaching and practice were demonic was undoubtedly correct. Regrettably, Roberts did not come to see as evil all, but only some, of his revelations from the spirit world. Furthermore, he did not consider sola Scriptura and cessationism as the “antidote to deception,” but the doctrine of the Cross that Jessie Penn-Lewis had herself learned by a vision in accordance with her belief in the Quaker Inner Light. Nevertheless, Roberts acknowledged that “he began to find it hard to distinguish Satanic suggestions from the Spirit’s promptings, and even harder to discern which ‘voices’ were only echoes of desires within his own mind.” He “could not always see when his visions and voices were . . . spiritual” and when they were not, and recognized that he needed help so that he could get to the place where he could “differentiate [the] voice [of the] Lord . . . from the cunning of the Evil One.” He had at one time stated: “I am as certain that the Spirit has spoken to me as I am of my own existence,” as he was “[a]t the time . . . hearing this actualized voice” while “heading for a bout of nervous prostration and depression and perplexity.” However, at another time he “told . . . [an assembly of] students that he was not even sure whether the Spirit suggested things or actually spoke.” Sometimes a spirit would speak to Evan in Welsh, sometimes in English, and sometimes in both. He had such close connections with the spirit world that “a voice” even told him things as small as to “draw a fourth line” underneath a word he had underlined three times or to command: “[R]ise from your bed.” A “voice” led Evan on the “journey which ended in a full acceptance of the doctrine of identification with the Crucified One” learned by vision and then preached by Jessie Penn-Lewis. As much by kin as I have been by God. He died in a Cardiff nursing home on 29 January 1951. Roberts’s final testimony was, sadly, far more like that of Demas (2 Timothy 4:10), and like those who confused standing up with conversion and regeneration in Roberts’s holiness revival meetings, than that of the Apostle Paul: “I have fought a good fight, I have finished my course, I have kept the faith: henceforth there is laid up for me a crown of righteousness, which the Lord, the righteous judge, shall give me at that day” (2 Timothy 4:7-8). Pg. 101, An Instrument of Revival, Jones. Pg. 183, The Pentecostals, Walter Hollenweger. Pg. 527, “Demythologizing the Evan Roberts Revival,” Pope. The “social effects of the revival,” although significant, lasted “only for a short time” (pg. 528, Ibid.). “Concern was expressed in the denominational press as early as 1907 that the chapels were emptier than they had been” (pg. 529, Ibid.). Pg. 102, An Instrument of Revival, Jones. Cf. also pg. 521, “Demythologizing the Evan Roberts Revival,” Pope. Pg. 525, “Demythologizing the Evan Roberts Revival,” Pope. Pg. 168, An Instrument of Revival, Jones. Pg. 180, The Overcomer, December 1914. Pg. 120, An Instrument of Revival, Jones. Pg. 126, An Instrument of Revival, Jones. Pg. 159, An Instrument of Revival, Jones. Pg. 173, An Instrument of Revival, Jones. Pg. 113, An Instrument of Revival, Jones. Pg. 108, An Instrument of Revival, Jones. Pg. 105, An Instrument of Revival, Jones. Pgs. 110-112, An Instrument of Revival, Jones. Pg. 114, 116, An Instrument of Revival, Jones. Pg. 109, An Instrument of Revival, Jones. Further instances of visions, voices, and similar manifestations, some of which Roberts affirmed were from God, and others from Satan, are recorded on pgs. 25, 26, 29, 31, 35, 40, 48, 77, 84, 104, 113, 135, 154, 267, An Instrument of Revival, Jones. Penn-Lewis argued: “Joel said in those days will I pour out my Spirit.’ The expression [i]s in the long Hebrew tense, expressing continuance of action, literally an incoming, unfinished, and continuous outpouring[.] It therefore appears that the words ‘in those days’ cover the whole dispensation of the Spirit, beginning with the Day of Pentecost” (pgs. 14-15, The Awakening in Wales). For this reason, although Joel is actually not speaking about the “dispensation of the Spirit” in the church age in context, since “those days” (Joel 2:29; 3:1) refers to the Tribulation period (3:1ff. ), Penn-Lewis nonetheless goes on to argue in later portions of The Awakening in Wales that the signs and wonders of Joel 2 should be expected in her time and in the remaining portion of this age. Her alleged proof from the fact that the Hebrew verb, “I will pour,” is in the imperfect tense, is not a little curious; that tense is exactly what Joel would use to express a simple future, and the verb in the imperfect cannot possibly bear her “incoming, unfinished, and continuous” idea the overwhelming majority of the time it appears in the Bible (Genesis 37:22; Exodus 29:12; Leviticus 4:7, 18, 25, 30, 34; Deuteronomy 12:16, 24; 15:23; 2 Kings 19:32; Job 16:13; Psalm 42:4; 102:1; 142:2; Isaiah 37:33; Jeremiah 7:6; 22:3; Ezekiel 7:8; 33:25; Daniel 11:15; Hosea 5:10; Joel 2:28–29). However, since Mrs. Penn-Lewis knew no Hebrew, perhaps her argument is understandable, if invalid. Pg. 216, An Instrument of Revival, Jones. Pg. 221-223, An Instrument of Revival, Jones. Pg. 221, An Instrument of Revival, Jones. Pg. 224, An Instrument of Revival, Jones. Indeed, in the 1930s there was “a serious decline . . . [in the] thousand nonconformist chapels of Welsh Wales . . . [a great] decline in spiritual vitality” (pg. 225, Ibid. ), a decline, indeed, that set in immediately after and as a result of Roberts’s ministry in the holiness revival of 1904. Roberts wrote about the decline in Welsh Christianity in the years after the holiness revival in 1904 through the 1930s: “Where are the multitudes which used to grow on the rich meadows of the precious Gospel?” (pg. 269, Ibid). Pg. 224, An Instrument of Revival, Jones. Pg. 225, An Instrument of Revival, Jones. Pgs. 228, 248, cf. 225-258, An Instrument of Revival, Jones. Pg. 182, The Pentecostals, Hollenweger. Pgs. 239-240, An Instrument of Revival, Jones. Pg. 247, An Instrument of Revival, Jones. Pg. 249, An Instrument of Revival, Jones. Calvinistic Methodist Archive, National Library of Wales, 25632, cited pg. 526, “Demythologizing the Evan Roberts Revival,” Pope. Pg. 526, “Demythologizing the Evan Roberts Revival,” Pope. Contrast the inaccurate statement that Roberts died “a man of rare charm and spirituality” on pg. 129 of The Keswick Story: The Authorized History of the Keswick Convention, Polluck. Polluck would have done well to dig more deeply rather than simply reproducing the hagiography of Roberts’s obituary.